Classic Chevrolet Sugar Land increased safety, eliminated security lapses and improved productivity with SecureCheckNOW's Total Security Solution. Security and surveillance are very important for the management of any car dealership. With $100 million in assets on the grounds at any given time, reliable video security is critical for Classic Chevrolet Sugar Land. Everything from the nuts and bolts in the parts department to the vehicles on the lot require 24 hour surveillance. Corporate, business and industrial security are the specialties at SecureCheck, LLC. They take pride in the motto, “We’re On Guard So You Don’t Have to Be”. Using the most up-to- date surveillance technology, SecureCheck is able to provide video surveillance utilizing the latest in analytical software for the entire footprint of Classic Chevrolet Sugar Land. With over 100 years of combined law enforcement and commercial security experience, SecureCheck has the knowledge that it takes to protect any sized facility where response times are measured in seconds. Classic had an aging camera system that they used in conjunction with a series of security guards to physically patrol the grounds. The contract for these services was literally for hundreds of thousands of dollars per year. That sense of security promised was used to justify these costs. After meeting the SecureCheck principals, Jack Molho and Al Cantu, David Alexander, Operations Manager of Classic Sugar Land was convinced that their current security system was not only costing them too much but it was also leaving the property open to theft through lapses in the security services provided. It wasn’t until their free site survey that they found out that they had lapses in video coverage as well as bringing to light the false sense of security the physical guards provided. Many companies have security systems and protocols that leave have lapses in coverage. In Classics case, there were areas of the lot that would not be monitored for 30-40 minutes at a time. Such large blind spots were the first thing the technical staff at SecureCheck noticed and provided for in the upgraded system. 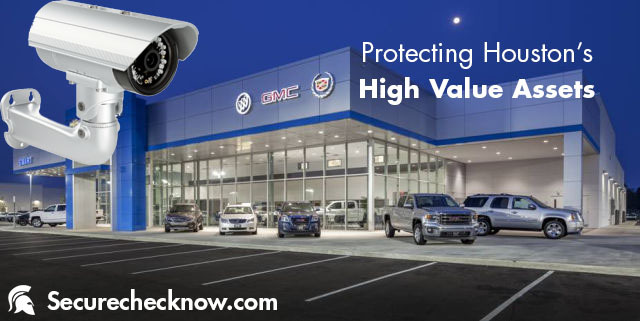 In receiving the contract to manage Classic Sugar Land’s video surveillance systems, SecureCheck was put in charge of protecting over 1200 vehicles and over 80,000 square of showroom, parts and repair facilities at one of the national largest car dealerships. To save money, the traditional system of patrolling guards was eventually phased out. A team of guards cost more per hour and have proven to be less accurate, versus current analytical software which operates 24/7 – never takes a lunch and never calls in sick. In the new system, the guards are not eliminated completely, the reduced staff has been re-tasked to interpreting the warnings and alerts sent in via the monitored camera system. The new SecureCheck system cuts down on false alarms while at the same time drastically cutting down on the time it takes to notify the proper authorities. Management at Classic Sugar Land now also has access to real-time information regarding the status of the system via the SecureCheck smartphone and web apps. The SecureCheck and Classic Sugar Land partnership has been of great benefit to both companies. Classic is achieving huge cost savings over the former security system and SecureCheck is benefiting from having a reliable corporate partner. SecureCheck LLC is a full-service security company providing video surveillance and analytical detection services. Locally owned and operated, the company is staffed by current and former law enforcement professionals with extensive experience in investigative services. SecureCheck is a member of the Better Business Bureau, National Association of Auto Dealers and Houston Association of Auto Dealers. For more information visit http://www.SecureCheckNOW.com or by calling 888.534.1834.